We still have no official release date for the next-generation Nintendo console, the Wii, but as of today we do have a price. Sort of. Confirming news first announced in Japan, Nintendo of America announced that the Wii will retail for no more than $250. 6 million units will hit the channel between the 4th quarter release and March 31st, 2007. Maybe we should start counting off, to make sure the demand won't exceed the supply. I'll go first. In other Nintendo news, the company hopes to sell 17 million Wii games in the same window, and 16 million Nintendo DS units. 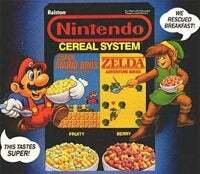 No word on whether or not the company intends to bring back Nintendo the cereal, but I've had my fingers crossed for almost twenty years. Don't crush my dreams, Nintendo!